The death domain of TNF-R1 is capable of self-association and subsequent apoptotic signaling, as demonstrated by over-expression of DD constructs for TNF-R and Fas . It is probable that, upon formation of the TNF-TNF-R complex, interactions among receptor DDs generate interdomain binding sites for adaptor proteins such as the TNF-receptor-associated death domain protein (TRADD) or Fas-associated death domain protein (FADD) that are not present in unli-ganded receptor molecules. The crystal structure of a death domain complex (involving DDs from the Drosophila proteins Pelle and Tube)  and that between the CARD domains of Apafl and Caspase 9  reveal two non-overlapping interfaces that, it has been postulated , could be exploited to form a heterotrimeric DD complex. Figure 3 A view of the complex between TNF-P and three molecules of the TNF-R1 ECD . The complex is viewed along the three-fold axis of the TNF-P trimer, looking toward the plasma membrane. 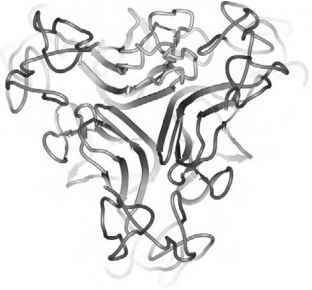 Subunits of TNF-P are red, green, and gray, and the polypeptide backbone of the TNF-R1 molecules is gold. partners, including the adaptor protein FADD and the serine/ threonine kinase RIP1 [9,10]. The amino terminal DED of FADD can form a complex with the corresponding DED of procaspase 8, thereby increasing the local concentration of apoptotic proteases at the plasma membrane . 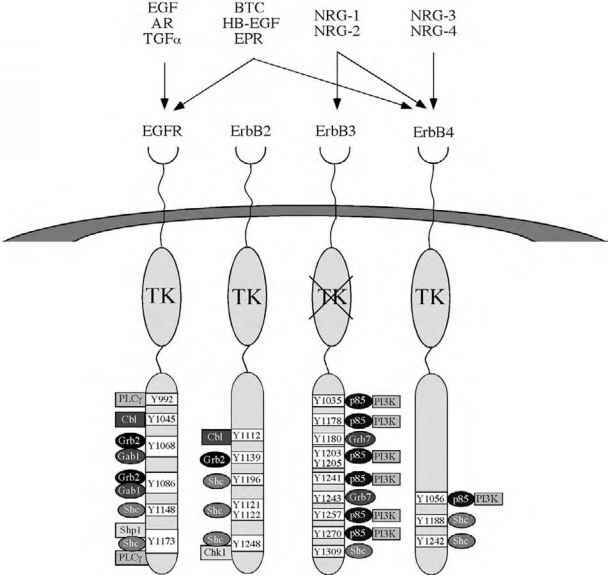 TNF-TNF-R1 can also elicit cell proliferation by recruiting TNF-R-associated factors (TRAFs), which mediate the activation of NF-kB . The C-terminal domain of TRAF-2 trimerizes through a coiled-coil segment and possesses an «150-residue P-sandwich domain that binds to the N-terminal a/p sandwich module of TRADD . TNF-R2 contains no DD and therefore cannot elicit an apoptotic response. It does, however, contain a short «10-residue cytosolic sequence to which TRAF domains bind [40,41]. The affinity of TRAF-2 for TNF-R2 is considerably lower than that for TRADD, suggesting that TNF-R2 is the less potent signaling receptor. TNF and its receptor complex are ultimately cleared from the cell surface through a clathrin-mediated endocytic pathway [42,43].